Crystal Kay is a J-pop singer. She mainly uses her first two names Crystal Kay as her stage name, although she is known by many fans as "Kuri." 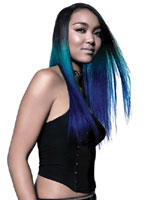 Crystal Kay is part of the Sony Music Entertainment Japan records label. Crystal Kay was born to an African American father (a bassist from New Jersey) and a third-generation Zainichi (person of Korean descent born in Japan) mother who was a professional singer. Growing up with musicians as parents influenced Crystal to launch a musical career of her own, which she accomplished with her debut at age 13. Prior to this, she provided voiceover work for a television commercial at the age of six. After the well-promoted collaboration with m-flo in 2003 and a #2 album, she became known to the public. She scored her first top 10 hit with "Motherland," which was used as the ending theme for the anime Fullmetal Alchemist in 2004. Her best-selling single in her career so far is 2005's "Koi ni Ochitara" which was used in the drama Koi ni Ochitara: Boku no Seikō no Himitsu and peaked at #2 on the weekly charts, and became the 30th best selling single of 2005 with an estimated 288,629 sold. In 2006 Crystal released "Kirakuni;" her second single with a lead song that is sung in full English, the first being "Shadows of Desire". Soon after that Crystal Kay released a new album called Call me Miss... that peaked at #2 on the Weekly Oricon Album Charts. Crystal is set to start off 2007 with a new single called "Kitto Eien ni". The single was released on January 17, 2007 and will be used as the theme song for the 2007 live-action movie of Boku wa Imouto ni Koi wo Suru. Crystal's next single was "Konna ni Chikaku de" which was released February 28, 2007, and is the ending theme to the anime Nodame Cantabile. On March 24, 2007, Crystal Kay was featured in m-flo's latest video "Love Don't Cry" for the last installment of the "m-flo loves" series. It is said that m-flo started this project with Crystal Kay and wanted to end it with her. They previously collaborated with each other in the "REEEWIND!" and "I LIKE IT" singles. Crystal's recent single is "あなたのそばで" (Anata no Soba de) which was released May 16, 2007; this is her first single with only one track and is described as a love anthem with an R&B essence. Her seventh and most recent album, "ALL YOURS", which was released on June 20, 2007 premiered at #1 on the Oricon daily charts with 6,011 copies sold and continued to stay at #1 through the week. ALL YOURS is her first #1 album in her entire eight year career. As of July 23, 2007, ALL YOURS has sold approx. 121,000 copies.